It’s that time again. That test again. Now in its 28th running, Autocar’s Britain’s Best Driver’s Car (BBDC) competition has been the ultimate arbiter of greatness among new sports cars as varied as the original Lotus Elise and Honda NSX, the Lamborghini Murciélago and the Porsche 968 Club Sport. It is the original big magazine annual ‘supertest’ and its format has been copied and adapted many times, but its endorsement is no less meaningful to sports car buyers today, and no less coveted by car manufacturers. This year it was to the sublime roads of north Wales and then the spectacular Anglesey Circuit that we headed for the occasion. The weather couldn’t have been better (as the images you’re about to see should attest), nor the welcome warmer. Huge thanks are owed to all at Trac Mon for their hospitality. And for the at-the-wheel thrills, we’re about to award the most glorious and glittering credit we can muster to the cars you’re busting to read about: the Aston Martin Vantage GT8, Porsche 911 R, McLaren 675LT Spider, BMW M4 GTS, Honda NSX, Jaguar F-Type SVR and more. Strap in, then, as we recount the tale of two flat-out days of driving, judging, documenting and arguing, conducted on both road and track, from behind the wheel of our reigning BBDC champion – the awesome Ferrari 488 GTB – and the 10 newcomers seeking to roar off with its crown. I am driving an Aston Martin Vantage GT8 to Wales. Initially, I thought I should have been in a DB11 – it is the most significant Aston in decades, after all – but my colleague Matt Saunders has dissuaded me. “We want a GT8, not a DB11, in this contest,” he says, having driven both. “It’s a driver’s car. Trust me.” So I do. And he’s right. Some car companies talk about a ‘50-metre test’. That’s all the distance your brain needs to assimilate the messages it’s receiving through your hands, feet, eyes and ears after you first get into a car. It begins to let you know whether you’re in the presence of something special, or not. The GT8 wants about a tenth of that distance. In its case, the only thing you need 50m for is protecting your ears from the noise of its 440bhp 4.7-litre V8. In 2008 I raced a V8 Vantage and I swear it wasn’t as loud as this one. It is one of the last big naturally aspirated engines and next year it’ll be replaced by a new Vantage’s Mercedes-AMG V8, which will have two turbos. If, with the GT8, Aston was letting loose all the 4.7-litre naturally aspirated unit could do, it couldn’t have picked a more magnificent send-off. In Wales, the Aston will meet the nine other best driver’s cars of this year, plus Ferrari’s 488 GTB, which returns as defending champion. We will spend a day on some glorious roads and a day at the extremely wonderful Anglesey Circuit. By the end of it, each car will have amassed up to 300 points, a maximum of 25 each on road and track per judge. The Aston, as it turns out, has well and truly won me over on the route up to north Wales. There’s a solid chassis and driveline to back up the sound. The V8 has the slight zingy, elastic throttle response at lower revs that it has always had, but it drives through a six-speed manual gearbox, has “excellent pedal positioning for heel and toe downchanges”, according to Andrew Frankel, plus steering that’s “still among the best here”. It certainly is that: the hydraulic set-up offers loads of road feel, and although there’s a little too much corruption, the GT8 is an overwhelmingly involving car to drive on the road. When I tell you that despite its myriad charms, the Aston places only sixth on the road, with 119 points out of a possible 150, that tells you quite a lot about the strength of the competition here. I’ve mentioned that the Aston is one of the most engaging cars on the road, so let’s talk about one of the least. 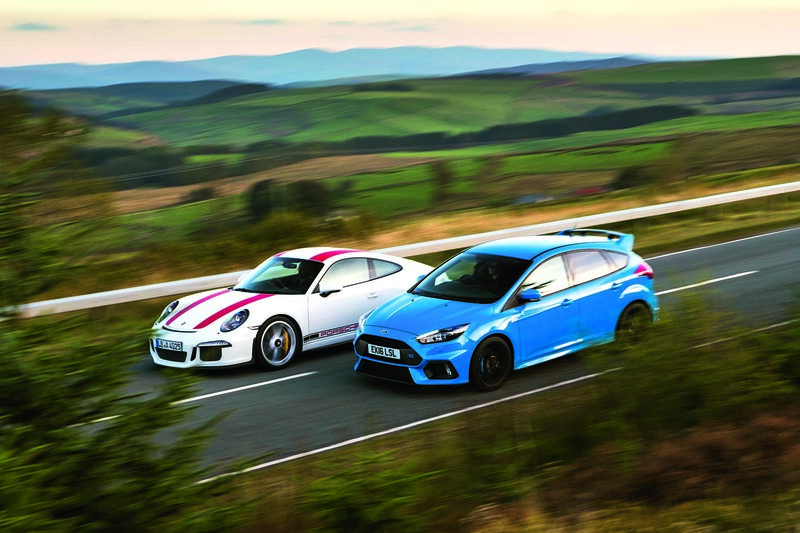 Ford’s Focus RS is a five-star road test car, but in this company, it “shows its working class roots”, says Matt Saunders. I’m confident no other hot hatchback would have had the RS’s ability – we did consider the Volkswagen Golf GTI Clubsport S – but ultimately the RS was the victim of the cambers of “Welsh A-roads that brought a few undesirable tendencies out of the steering”. The Focus is, although capable, not a car that grabs you by the lapels and demands your attention. Still, with 92 points from a possible 150, it isn’t in last place on the road. That dubious honour falls to the BMW M4 GTS. If you’re prepared to get much busier than we had time for with a box of spanners, it’s possible to take the track-focused GTS and tune its dampers for the location you find yourself at. There’s a Nürburgring-specific set-up listed in the handbook, for example. But however bumpy the Nordschleife is, it is not north Wales on a Monday morning. “Exciting, like being shot at,” says Mike Duff, who finds it “much too harsh and seemingly at war with its stability control.” You can tell there are hints of goodness in here. It’s reminiscent of the old M3 GTS, another track refugee. But the chassis is unremittingly stiff and the turbocharged straight six rarely gets a chance to give its best. I suspect more will come on the track. At least, I hope so. A standard M4 would sit quite nicely next to a Porsche 718 Cayman S, but compared with the M4 GTS, the Cayman is night and day different. The BMW takes 73 points, whereas the Cayman scores 129, making it the fourth most likeable car on the road. “More than ever, the Cayman is all about the way it handles and steers,” says Allan Muir, ably nailing the most impressive thing about the Porsche. Where the BMW shimmies and skips, the Cayman’s suppleness allows it to flick away surface imperfections with ease, while its steering – although less feelsome than it was years ago when it was hydraulically assisted – has been finessed and honed to a differently appealing state. “So hard to criticise,” says Frankel, diplomatically overlooking the engine. “Apart from the engine, of course.” Oh. Moving on, then, to another would-be rival to the Cayman. The BMW M2 has an engine of six cylinders. “I love the engine and performance level,” says Saunders. “I love the punchy manual gearchange.” Me, too, mate. When Porsche released the Cayman GT4, the engineers said it was “old-school, but not old-fashioned”. The M2 doesn’t mind seeming old-fashioned in its “route one” (Saunders) set-up. It’s an honest, straightforward, front-engined, rear-driven coupé. Less sophisticated in the chassis department than a Cayman, for sure, but still “probably the car I’d take home if I were going to live with it every day”, says Muir. And you can understand why. The roads around north Wales are quiet, lumpy and open, but no matter how open and well sighted a road is, when there’s a limit of 60mph, you have to select a car carefully that’ll let you enjoy yourself up to that point. With the remaining cars we have to deal with, you have to wonder whether they’ll manage it, so far will you be from their respective limits. 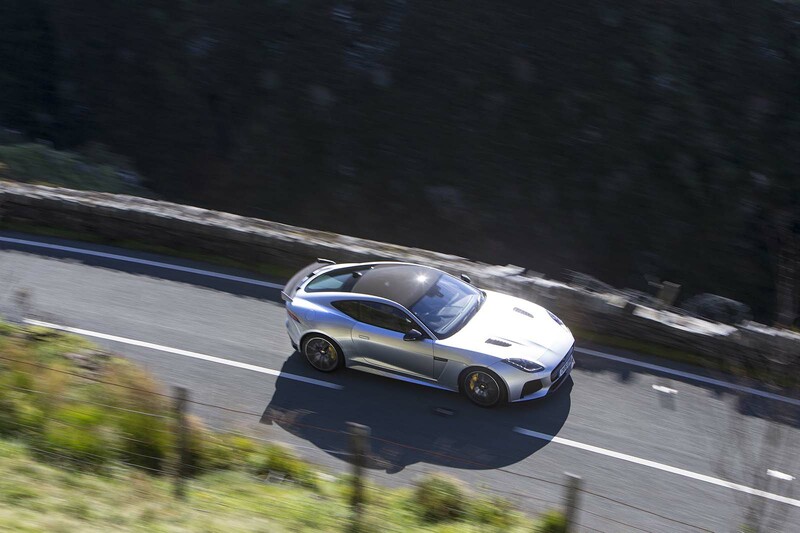 The SVR’s rocketship of a supercharged engine – “honking, powerboat-style silliness”, says Nic Cackett – is a league above the F-Type R’s, but its chassis sophistication is something I hadn’t expected. It steers well, too: firmly and with good road feel. A slightly tippy-toed, high-riding feel marks it down consistently, plus the fact that, when all’s said and done, it’s a near two-tonne GT car, but if your daily commute was on these roads, the SVR would be a hard car to beat. On the road, with 110 points to the Jaguar’s 104, the Honda NSX only just beats it. Ah, the Honda. We’ve a lot of time for this car. “Would dearly love to have placed it higher, if only for sentimental reasons,” says Saunders before adding its “imperfect ride and sheer width on narrow B-roads are my reservations”, both fair points. “The NSX is set up with the same kind of sturdy, direct and foolproof style as an Audi R8,” says Cackett. We’re confident the NSX would have eased out the R8 had one been here, but you get the idea that, in this toughest of environments, the NSX will do no better than hold its own, on the road, at least. 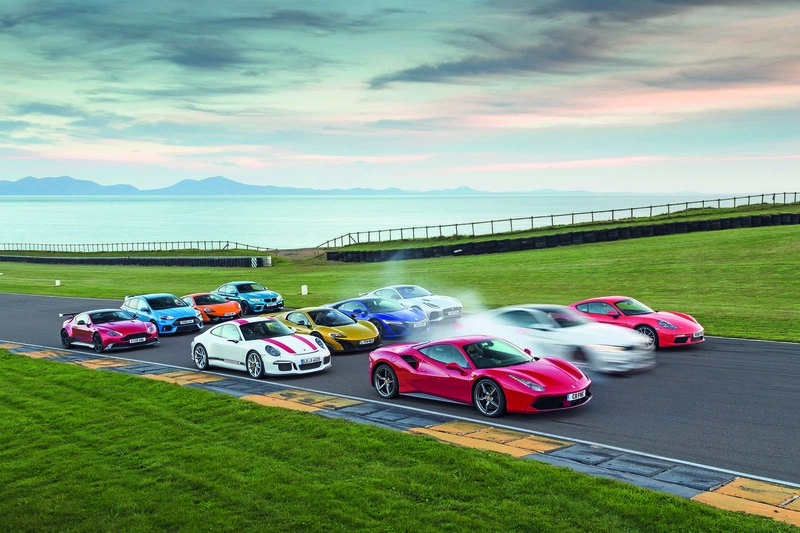 Which leaves the really quick stuff – the stuff that will have to work even harder to impress at road speeds, given the limits of the McLarens 570S and 675LT, the Ferrari 488 GTB and the Porsche 911 R.
That I’m including the McLaren 570S among these despite it having less power than the NSX is a measure of its sheer ability, but if McLaren – still this young, agile company – has learned anything, it’s how to make its cars engaging at sensible speeds. The 570S rides with a deftness that it shouldn’t have, given that it lacks the hydraulically linked suspension of its bigger brother, and it steers – hydraulically rather than electrically assisted – with extraordinary panache. “Steering lovely; never less than pin sharp,” says Cackett, and Muir finds he’s “able to drive it harder and with more confidence than the 675LT, therefore taking more pleasure out of every mile”. Muir almost makes the Toyota GT86/Morgan 3 Wheeler argument, there: the slower the car, the more likely you are to be able to get on top of it. But still, the difference between the lesser McLaren’s 562bhp and the Longtail’s 666bhp is hardly the difference between a VW Beetle and a Porsche 917. These are still both blisteringly fast cars, but it’s true that the 570 feels that touch more manageable on the road. Frankel finds it “better on road than track” – more on which in a moment – but at the end of a day’s road driving and score-totting, it’s no surprise that the 570S is the second-favourite car here. Only a few points behind it is the 675LT, which, despite probably the most astonishing level of performance here, still manages to give stacks of feedback and engagement and fun even if you’re barely touching its phenomenal ability. And then there are the two from the biggest names in the business. Porsche’s 911 R feels like the GT3 we always wanted and, in a way, most of the time it’s not too fast – because, given that it is naturally aspirated, you have to be entirely up for it to access its full performance. “You have to work for it,” says Muir. That’s not true of the Ferrari 488 GTB, whose turbocharged engine is incredibly responsive for a blown unit but also makes absurd torque in any gear, at any road revs. When we finish our day’s driving, though, it’s Porsche and McLaren that would sit smuggest, were their representatives joining us for dinner. I don’t know how, but we went to north-west Wales for three days in early October – two for testing, the third for photos – and the sun shone on every single one of them. I’m certain there is no more picturesque race track in Britain than Anglesey, and the list of those that are more entertaining is pretty short, too. As is typical in a situation like this, at a time of the morning when a cup of tea is still as appealing a lap of a circuit, people tend to start in the slow stuff. Get to know the circuit. Get a handle on things. Build up to a pace. 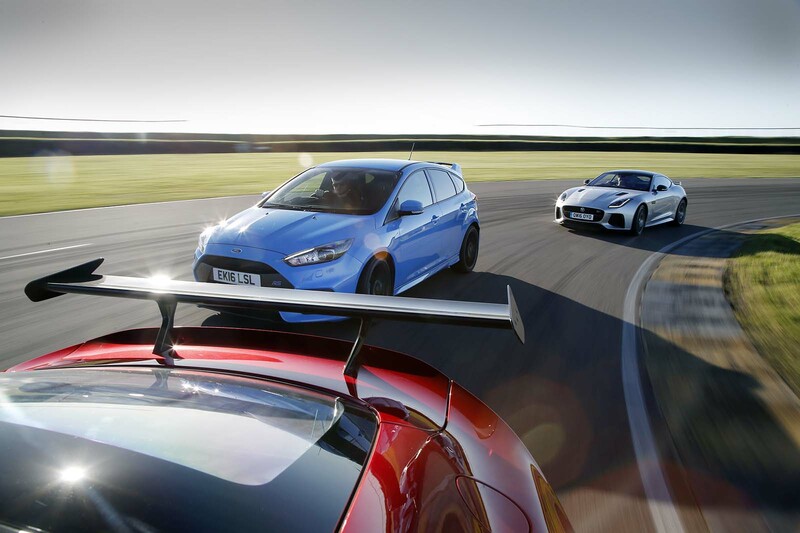 Trouble is, even in the relatively modest Focus RS, you’re still talking about a car that has 345bhp and a four-wheel drive system that is the equal of a Nissan GT-R’s. “You have to drive it like a lunatic to get the best out of it,” says Muir, which leaves the Focus feeling cold on the road but wins it some plaudits on the circuit. If you set the drive mode right (Drift), and the stability control right (off), the Focus will move around in cool ways, although rarely for more than a second or two at a time – unsettling its back end on turn-in and pushing into oversteer if you’re determined with the throttle on the way out of a corner, before drive resumes at the front and it pulls itself straight again. The power shuffling always risks making it more effective than ultimately enjoyable. Not so the M2, which, of all cars here, is perfect for learning a circuit yet also highly entertaining – and that’s how it comes to have mullered its brakes only a few hours into the day. “My favourite M car in longer than I care to recall,” says Frankel of an M car that has a really sweet front-engined, rear-driven handling balance and just the right amount of power to exploit it. You can drift an M2, but you have to want to, and it’s enjoyable even if you don’t. “Secure, and yet happy to play the hooligan,” says Duff. Everybody likes the M2 a great deal, which is more than can be said for the M4 GTS, which polarises opinion even though it should arguably be in its element on a circuit. Frankel finds it “has too much understeer in slow corners and is still jinking around in really quick curves”, although Saunders thinks it has “a sense of connectedness few could get close to”. I think it’s sensational too. To me, it feels like a race car: the roll cage squeaks, running over kerbs vibrates the whole body, and if you put the steering into its lightest mode, it’s easy to wind opposite lock on yet still be given bags of feel. It’s comfortably inside my top four but no one else’s, bar one of our hired hands, who once set a world drift record. I knew it would be. Yes, you have to manage the entry speed a little, but once you do, it has a sublimely adjustable balance, and I think you could happily spend days making the best of it. Leave me this circuit and only one car for a year and I might well pick this one. The Vantage GT8 is another car that frustrates some of our testers on the circuit. The 4.7-litre V8 is still impeccably charming – although on track it finds itself wound around to the redline, where it sounds like a GT4 car, rather than taken to 4500rpm and double declutched for the fun of it as you might on the road, because it sounds the spit of Steve McQueen’s Ford Mustang in Bullitt. “Definitely more mouth than trousers,” concludes Duff after a stint. Oddly, its front tyres go off first. For all its noise, it doesn’t have sufficient oomph to overwhelm the rears on demand, either. It’s a loveable car but is happier being roguish on the road, where its eagerness can be exploited and its limits aren’t exposed. I don’t expect the F-Type SVR to be much better, big, heavy GT car as it is. But it puts in a surprisingly good shift. Strangely, as did the Focus, it feels slightly tall and stilted and it leans too much early in corners. But, as Duff says, its “torque makes it effortless. It has tireless brakes and great rear-biased handling, with the all-wheel drive stepping in when the rear starts to slide”. Others find the fun slightly spoilt by the front drive cutting in – as if you’ve still got the stability control on – but it performs better on a track than it has a right to. Its nearest rival – in the marketplace and in our test – holds itself back rather less. The 570S is restrained only by the standards of its 675LT brother. The facets that made it so appealing on the road are, undoubtedly, present on track, too: the fabulous steering and a sense of great agility, due to the fact that it’s more than 300kg lighter than the NSX. However, “I’ll admit to preferring it on the road”, says Cackett, where the 570S’s absence of a limited-slip differential makes precious little difference to the way it drives – perhaps improves it. 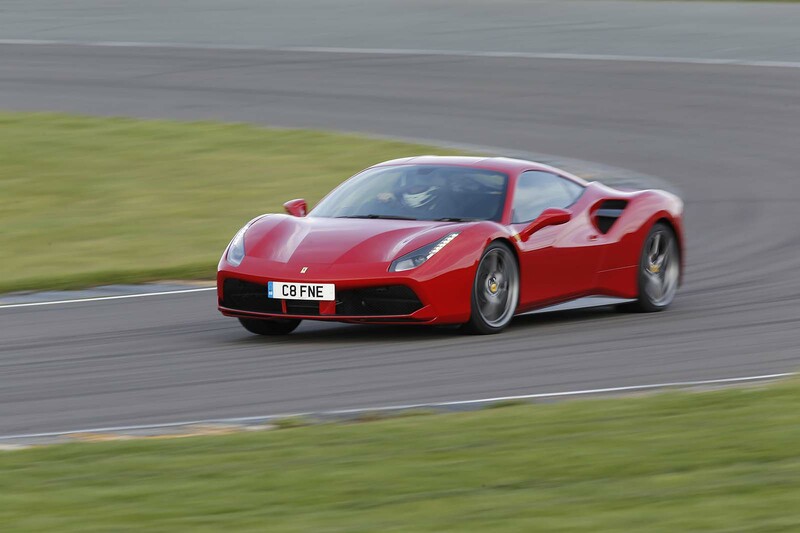 But on a circuit, its brake-steer technology and the fact that it’s only truly mobile in corners that give you the opportunity to trail the brakes in mean “it’s just easier to fall deeper in love with the adjustability of the 911 or 488”, Cackett says. They have better engines, too. What could also do with a more characterful engine? It’s the 718 Cayman S, according to Saunders, who is also recording lap times in all the cars. The 718’s turbo four “gives much more instant torque and grunt than the 911”, he says, “and could keep up with anything else here thanks to that handling.” And that, in a nutshell, is the Cayman denuded. Everything that makes it a superb road car also makes it a wonderful track car: its fluid steering, tight body movements and perfect balance. It’s so good that it could do with another 50bhp to fully exploit its chassis but, as Saunders says, its “lap time underlines its dynamic brilliance. It felt perfectly geared for Anglesey and had cornering composure to spare. Never missed an apex and never clipped a catseye. For the money – incredible”. If you’re wondering how high the bar in this competition is, consider that the Cayman has one of the finest sports car chassis ever made and yet its combined total – 255 points out of a possible 300 – was only good enough for fifth place in this company. Even the 11th and 10th-placed cars – the M4 GTS, whose track ability couldn’t lift its overall score higher than the Focus RS’s – were good for 185 and 192 points apiece. Everyone even loved the F-Type, M2, NSX, and Vantage GT8 – ninth to sixth. And beyond the Cayman, the 570S finishes fourth, making a top five occupied by two Porsches, two McLarens and one Ferrari. Which leaves only three cars left to talk about, then: the 675LT, 911 R and the returning champion, the 488 GTB. Precisely how they fill the top three positions is a story I leave to Andrew Frankel. "...but its endorsement is no less meaningful to sports car buyers today" - Actually it is because sports car buyers nowadays cannot buy some of the contenders e.g. 911 R.
Would it kill you to write the verdict in a list format so we don't have to read the unintelligible verdict paragraph three times to understand what the fudge you are on about? Cayman for me please. Gulf Blue. Me neither, I'll take a previous winner, gt86, or was that best handling as opposed to best drivers? Either way it does it at a fraction of the cost and will soon be affordable for me as a used buy. The conclusion wasn't that hard to understand, was it? Interesting that Road and Track placed the Evora 400 second "Without a doubt, the Lotus is the best pure driver's car in the group" but it was a thin field, no McLaren, no Ferrari and only the 911 Turbo S, and anyway they gave first place to the NSX, so what do they know? Their reasoning seems to be no more than relief that the Honda suggests the next generation of hybrid sports cars won't be disastrously uninvolving. Why was the Ford Mustang V8 not included in this round up? Could it be that its because its slow, dim witted and couldn't find its way past something like a Fiesta ST at half its price, let alone something costing similar money like a Focus RS? Nope, it ran out of petrol on the way. I still like the mustang though.